The Chamber's Annual Awards Banquet this past Saturday was a huge success! 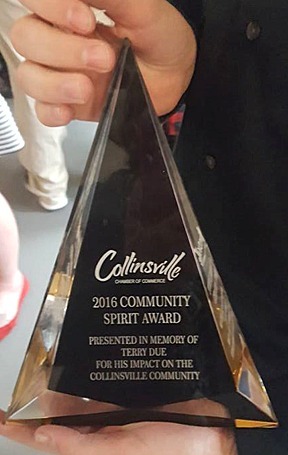 We were honored to be able to present a Community Spirit Award to the family of Terry Due in recognition of the lasting impact he made on Collinsville. Thank you to Lance West for helping us to honor his memory. Outgoing Board President, Scott Reeves, was also recognized in appreciation for his outstanding service and dedication to the Chamber. Thank you for all you've done for the Chamber, Scott! Special thanks to the National Honor Society and Collinsville FFA volunteers; Ted Wright and Norm Van Sickle for sharing their photos for the slideshow; James Roderick for serving as our Master of Ceremonies; Jerry Shannon for running our audio/visual equipment; Collinsville Livestock Sales for overseeing the live auction; Cyn-Pro Graphics for designing the banquet flyer and program; The Cake Lady Collinsville, Brookdale Owasso, and Kim Miller with Collinsville Downtown, Inc. for the delicious desserts; and all who donated silent auction items.